1. Cast on 35 stitches. 2. 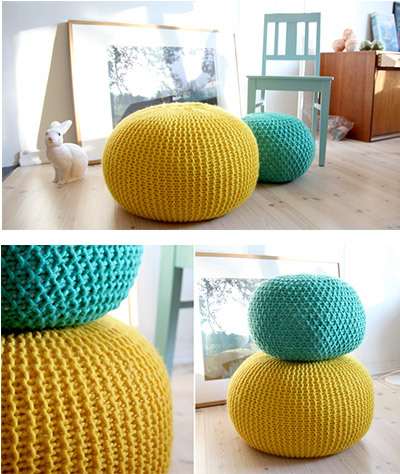 Stitch until you´ve knitted up almost all your wool, and there is just enough wool left to assemble the ottoman. You now have ONE rectangular piece. Cast off loosely. 3. Assemble the short sides (35 stitch side) as neatly as you can. 4. Assemble the first long side. This is supposed to be the top or the bottom of the ottoman. Put the needle through the end stitch of every second row and tighten, tighten, tighten. Use a stronger wool if it is difficult. Repeat on the rows in between and tighten until there is no hole in the middle. 5. Stuff the duvets into the ottoman. Try to make a ball of the duvets before you stuff it. 6. Assemble the other end in the same manner as the first.